Britain’s National Union of Students adopts a policy of BDS against Israel. Britain’s National Union of Students (NUS) has voted to boycott Israel, The Jewish Chronicle reports. The decision came at a special meeting on Monday, during which the NUS national executive committee adopted a policy of Boycott, Divestment and Sanctions (BDS). Under the policy, which passed with 23 votes in favor, 18 against and one abstention, student unions around the country could impose sanctions on Israel and support campaigns to boycott Israeli products on their university campuses. The Union of Jewish Students was quick to condemn the move. “For all the insistence from campaigners who argue BDS doesn’t target individuals, time and time again this is proven not to be the case,” a spokesperson said, according to The Jewish Chronicle. “Even today at the vote, Jewish students reported to UJS that they felt intimidated and bullied by the antagonistic atmosphere,” she added. “NUS NEC have passed a policy that will only divide student groups, undermine interfaith relations and suffocate progressive voices for peace on both sides. 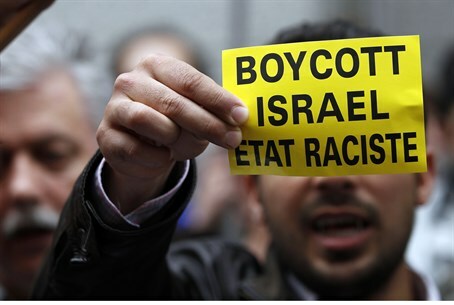 Several weeks ago, Britain's largest trade union voted to boycott Israeli companies in a unanimous vote. The UNITE union adopted the anti-Israel motion at its first policy conference, calling "to vigorously promote a policy of divestment from Israeli companies." The motion added that such a boycott would be "similar to the boycott of South African goods during the era of apartheid" - representing an adoption of the rhetoric of the virulently anti-Israel BDS (Boycott Divestment and Sanctions) movement, which seeks to portray Israel as similar to apartheid South Africa. There have been several attempts in several countries to block the sales of Israeli products from Judea and Samaria. Last week, Tesco, the UK’s largest supermarket chain, announced it will no longer sell products originating from Judea and Samaria starting this September. A spokesman for the supermarket said the move was not "politically motivated" and not connected to the Gaza conflict.